Preheat oven to 425ºF. Combine flour and icing sugar in large bowl. Cream butter in separate large bowl using an electric mixer and gradually blend in flour mixture. Work with hands to form a smooth dough. Press evenly on bottom and sides of 9" pan; prick with fork and chill 15 minutes. Bake in preheated oven for 7 to 10 minutes or until light golden. Cool thoroughly in pan on rack. Beat cream cheese, icing sugar and vanilla together in a large bowl of an electric mixer until smooth. Whip cream until stiff peaks form and fold into cheese mixture. 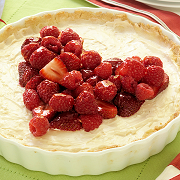 Spread evenly in baked crust and cover attractively with fruit, making a heart shape. Glaze: If desired mix jam and lemon juice together in a small bowl until smooth and brush over fruit.